Compliance carbon pricing in the region is limited to South Africa’s still-developing hybrid carbon tax and offsetting program. While voluntary activity in Africa has lagged behind other regions, voluntary buyers have demonstrated a firm interest in supporting charismatic land-based and household device offset projects in the region. South Africa’s carbon tax is set to take effect in January 2016. The tax is set at 120 rand per tonne, with a target of slashing carbon dioxide emissions 34% under the business-as-usual scenario by 2020 and 42% by 2025. A policy paper released by the country’s National Treasury anticipated that the resulting “tax-and-trade” program would raise between eight and 30 million rand annually. The carbon tax is expected to cover between 1,000 and 1,500 companies and 75% of national emissions; the forestry and agriculture sectors are excluded from the tax in the first implementation phase (2016-2020). Compliance entities will be allowed to purchase offsets to cover up to 10% of their emissions (or 5%, in the case of the iron, cement, glass, and chemicals sectors). Based on their allocations, compliance entities could demand up to 30 million tonnes of offsets annually, according to an analysis by carbon project developer Camco Clean Energy. The policy paper indicates that the four offset standards currently in use in the country – the Clean Development Mechanism, the Verified Carbon Standard, the Gold Standard, and the Climate, Community, and Biodiversity Standard – will be eligible for emissions reductions certificates. Historically, fewer than 3% of offsets developed under the Clean Development Mechanism were sourced from Africa – and voluntary project development, too, has lagged behind that of other regions. 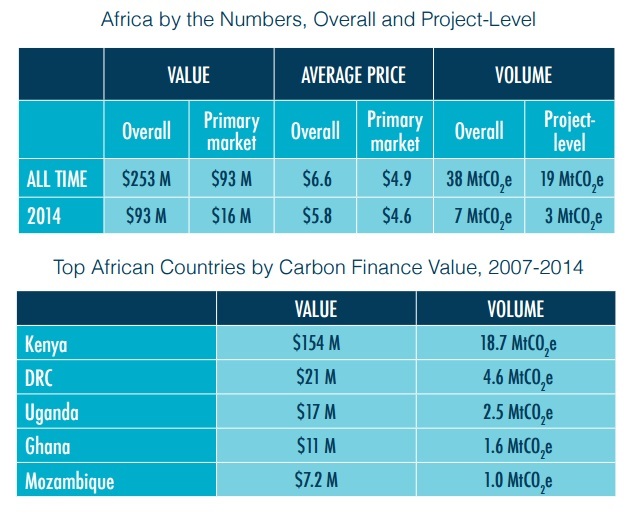 Voluntary buyers have spent a cumulative $253 million on African-based offsets over the past decade, about half of the cumulative value attributed to Latin America and Asia, respectively, according to Ecosystem Marketplace’s State of the Voluntary Carbon Markets 2015 report. Still, voluntary buyers have shown steady interest in supporting avoided deforestation, cookstoves, and other pro-poor project types in Africa. Project developers committed to the region are experimenting with new methodologies with large potential on the continent, such as avoided conversion of grasslands and blue carbon methodologies for mangroves. Demand for African-based offsets reached 6.7 million tonnes (MtCO2e) in 2014 with average prices of $5.7 per tonne, tracking above the global average. Suppliers reported transactions from 21 different African countries in 2014. Kenya-based projects led the way, transacting 3.1 MtCO2e in 2014 and accounting for nearly half of the continent’s volume over time. Historical project development has also been strong in the Democratic Republic of Congo (DRC), Uganda, Ghana, and Mozambique. Voluntary carbon market participants are also looking towards South Africa, where a 120 rand (about US$10) carbon tax is scheduled to start in early 2016. A policy paper released by the country’s National Treasury last year indicates that South African offsets developed under the voluntary carbon standards Verified Carbon Standard and Gold Standard will be folded into the compliance program – pending approval from the Designated National Authority. “Pre-compliance” voluntary demand among South African buyers, however, was modest, reaching just over 25,000 tonnes as regulated entities generally took a “wait-and-see” approach to the already once-delayed regulation.